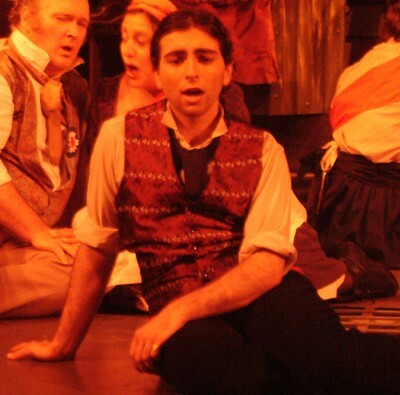 Maltese-Australian lyric tenor Christopher Busietta was born in Melbourne into of a family of musicans and singers, so it may not be a surprise then that he has pursued a musical career. He began his musical studies at the age of six, when he picked up the cello. For better or worse, he abandoned this instrument for the flute when he began high school. Towards the end of primary school, after blown away hearing the choir singing the descant parts of christmas carols at a school assembly, he joined the school's two choirs. He developed his love of theatre performing in high school productions, which in his final year included the musical South Pacific, but being a shy teenager, never in big roles. Music only took a serious turn of events when his brother started a rock band. Wanting to be a part of it, he agreed to learn the bass guitar and play, but his guitar teacher quickly turned him onto the guitar. Chris was not the lead singer of the band, but quickly learnt that he could write music and sing high harmonies. When the lead singer left the band, he moved from backing vocalist to lead vocals and thus a singer was born. He has played in several different original and covers bands over the years, singing and playing a number of different instruments, covering rock music from the 60's to the last decade. Photo Left: Intended promotional shot for Myopia album cover. 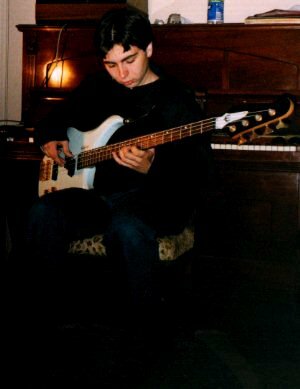 Christopher playing bass guitar, 2002. A couple of years after high school, while he was studying computer science, two things happened. Firstly, he had plucked up the courage to go and take singing lessons. Secondly, through a friend, whose mother was one of the directors of the Savoy Opera Company (a Gilbert and Sullivan society in Melbourne), he discovered that they were looking for tenors to join the chorus of The Mikado. He was thrown onto the stage for the first time in years and it was the first time he heard live classical singing. He enjoyed it so much he wanted to audition for a principal role in their next show, The Pirates of Penzance. His singing teacher, Zina Deuel, advised him that if he wanted to do this show, he would need to learn classical technique rather than pop/rock. The audition period came around and he was offered the part of Samuel in The Pirates of Penzance with the Savoy Opera Company which would be his first principal role. At this point, the whole direction of his career would change. Around this time he had left his high school band and began writing and recording the material for his debut album The Shadows, which has only been released and had its first live performances in 2011. 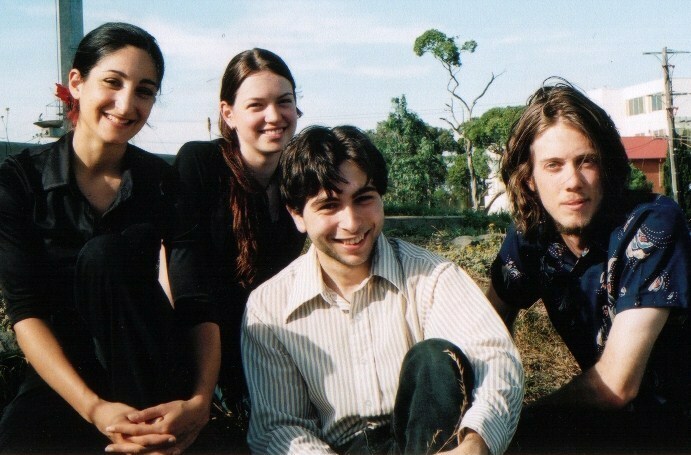 The Harrison Street Quartet, 2003. At this point, wanting a career in opera and musical theatre, he prepared monologues to audition for a drama course, and arias from oratorio and opera to audition for various music schools. He was accepted into the Melba Conservatorium of Music on the Robert Salzer Scholarship. From 2003 to 2006, after completing his Computer Science degree, Christopher commenced his formal musical studies, studying vocal technique under tenor Peter Mander. During this time he was awarded the Jean Robinson prize for his academic achievements. During this time he was still a very active performer. He was a member of folk a capella group, The Harrison Street Quartet, which released a CD of original a capella music and performed in pubs and private functions around Melbourne. He was also busy performing roles in community theatre and with several rock bands. In 2004, he made his professional singing debut singing the tenor solos from J.S. Bach's St John's Passion to critical acclaim. From that, he began to perform regularly in recital and as a tenor soloist in concerts and oratorio. He began to experience some success in singing competitions, the highlights included winning the Waverley Aria in 2004, the Australian Youth Aria in 2005 as well as being Royal South Street Society Vocal Champion. He was also twice a finalist in the National Liederfest and the Royal Philharmonic Aria, a runner-up in the Singer of the Year Competition and a semi-finalist in the Herald-Sun aria. Jesus Christ Superstar, Flashpoint Theatre 2003. His series of breaks came in 2006, when he was accepted into the extra chorus of Opera Australia's production of Gilbert and Sullivan's The Gondoliers, which marked his first appearance with a professional theatre company. 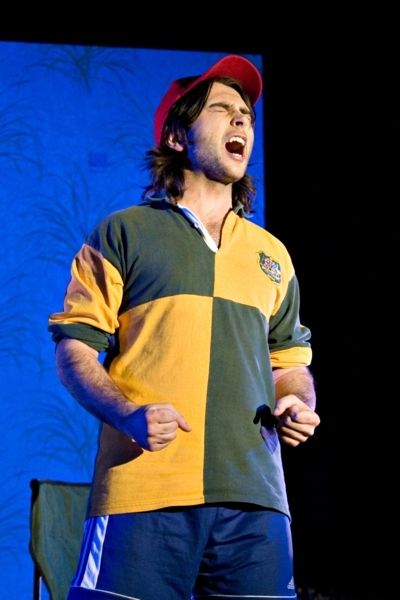 Later that year, he made his operatic debut as a soloist in the role of Pedrillo for Lyric Opera of Melbourne�s 2006 production of Mozart�s Die Entf�hrung aus dem Serail (The Abduction from the Seraglio) and whilst rehearsing this, he successfully auditioned for OzOpera's touring schools program. So, in 2007 and 2008, he was a full-time singer, touring primary schools all around Victoria as part of Opera Australia's education program as Count Almaviva in The Barber of Seville(Rossini) and the Prince Ramiro/Wicked Stepmother in Cinderella(Rossini). As well as being a lot of fun, the constant touring and performing went a long way in developing his stagecraft. During this time, Christopher also performed as a principal tenor with Lyric Opera of Melbourne playing Don Ramiro in Rossini's La Cenerentola (Cinderella), as Erwin in Anna Amalia's Erwin und Elmire and Shakhes in Fleishman's Rothschild's Violin with iOpera. 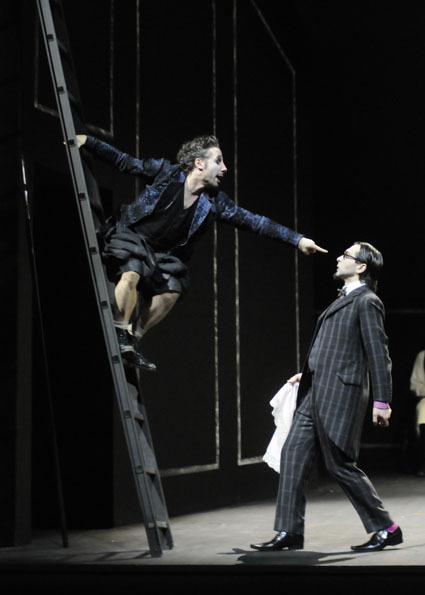 Photo (above): Christopher as Erwin, Erwin und Elmire (IOpera 2008). Photography by Belinda (http://www.artsphotography.net.au). Just as he was figuring out what to do next, he won the 2009 German Australian Opera Grant, whose main prize was a one-year contract to sing as a soloist with Hessisches Staatstheater Wiesbaden. That year he performed six roles in five operas including Dr Cajus in Falstaff and Gherardo in Gianni Schicchi, as well as understudying a further two, on top of grappling with the German language, continuing his vocal studies with Neumar Starling and auditioning all over Germany as well as in France and Switzerland. He auditioned successfully for Theater Augsburg and was employed from 2010 to 2017. For Augsbug alone, he will have performed over 300 performances on stage and in concert in 35 different productions. This does not include the produtions and concert performances with other theatres and orchestras. His notable roles include Nemorino (L'elisir d'amore), Don Ottavio, (Don Giovanni), Alfred (Die Fledermaus), Belfiore (La Finta Giardiniera), Witch (H�nsel und Gretel), Basilio (Le Nozze di Figaro) and der Steuermann (Der Fliegender Holl�nder). During this time he also sang roles with Hessisches Staatstheater Wiesbaden, Theater Aachen, Theater Augsburg, Landestheater Niederbayern, Theater Magdeburg, Staatstheater am G�rtnerplatz (Munich) and Oper Frankfurt. Amongst other music theater roles, he has also performed as Freddy in My Fair Lady, Woof in Hair and Curt in Blues Brothers - the latter two shows broke Theater Augsburg's box-office records at the open-air theatre (Freilichtb�hne). He continued his vocal studies with renowned vocal coach David Harper and Heldenbariton Stephen Owen. He also wrote more original songs and formed the folk-rock band Blue Macaw and the Folk Orchestra to perform his songs and arrangements of covers. Since his time in Augsburg, Blue Macaw has released three albums of music. Photo (right): Christopher as Dr Cajus in Falstaff. Hessisches Staatstheater Wiesbaden, 2010. "Christopher Busietta sang sich in die Herzen der H�rer [...] Mit lyrisch warmer, heller Stimme, schweigerischen Kantillen und wunderbar gelungenen H�her sang sich der australisch-maltesische Tenor in die Herzen der H�rer." - , 07. March 2011 Augsburger Allgemeinen Zeitung (Stephanie Knauer). Fasching Operetta Concert. "H�chstes Lob verdienen neben diesen G�sten auch die Mitglieder des Augsburger Ensembles [...] sowie Christopher Busietta, der mit hellem Tenor die Partien des jungen Seemanns und des Hirten klangsch�n gestaltet." - Barbara Angerer-Winterstetter, Donaukurier, 14. March 2011. ["The members of the Augsburg Ensemble also earn the highest praise next to the guest artists [...] as well as Christopher Busietta, who with light tenor, in the role of the young sailor and the shepherd, made a beautiful sound."